Once again, here is my disclaimer. Disclaimer: This post is about my faith. If that makes you uncomfortable then please stop reading. It is not my intention to make my readers feel awkward in any way. I am a member of The Church of Jesus Christ of Latter Day Saints. I am very proud of that part of me and I love the church with all my heart. Twice a year the church has a worldwide conference. I love the inspiration that I get from those conferences to be a better person and to serve others always. During the Saturday afternoon session Elder Russell M. Nelson gave an amazing talk that hit home with me. I absolutely loved it and I wanted to share my thoughts and feelings with you. I hope you find it informative and enlightening. One quote he gave during his talk was this, "One of the realities of mortal life is that our faith will be tested and challenged. Sometimes those tests come as we face what appear to be life-and-death encounters." Isn't that so true? I think we all go through life smooth sailing. Not really thinking of anything really. Then when we are in certain situations it makes us step back and think about our current situation and our purpose of this thing we call life. We all need reality checks every once in awhile, right? Another quote that really got me thinking was, "The word religion literally means 'to ligate again' or 'to tie back' to God. The question we might ask ourselves is, are we securely tied to God so that our faith shows, or are we actually tied to something else?" VERY GOOD QUESTION. This world can become very confusing. I can find myself caught up in the "worldly" things. The things that really do not matter. Take social media for example. I can get so caught up in social media that I begin to ignore (basically putting social media first) my family. Isn't God's greatest commandment to love him and others? Well if I am so enthralled with social media (insert anything that keeps my attention away from my family) and don't love my family fully then am I really tied back to God? Not in that moment. That is for sure. "There is only One in whom your faith is always safe, and that is in the Lord Jesus Christ. And you need to attempt to return the favor. The next quote I want to mention is quite lengthy, but totally worth every word. So please stick with me. "I had such a test (test of faith) decades ago when one of my medical faculty colleague chastised me for failing to separate my professional knowledge from my religious convictions. He demanded that I not combine the two." This is my favorite part. "How could I do that? Truth is truth! It is not divisible, and any part of it cannot be set aside. Whether truth emerges from a scientific laboratory or through revelation, all truth emanates from God. All truth is part of the gospel of Jesus Christ. Yet I was being asked to hide my faith. I did not comply with my colleague's request. I let my faith show!" I have hid my faith many, many times. I am quite ashamed of that. I know that my faith is not as strong and bold as others, but I have faith. I really should focus on strengthening that faith and showing it much more. I am not saying force it on people. That is not letting your faith show. That is just being rude. I am just talking about not hiding it. He goes on to say that, "Spiritual truth cannot be ignored--especially divine commandments. Keeping divine commandments brings blessings, every time! Breaking divine commandments brings a loss of blessings, every time!" Is that not so true? Lets go back to the most basic and first commandment. Love him and then love others. If we show love to someone don't we see blessings. We feel better. On the contrary if we do not and we treat others badly we experience a loss of blessings and we feel terrible about ourselves. We need to strive to be true disciples of Christ, to love others, and to serve others. He explains this in a great way. He says, "living the Lord's pure religion, which means striving to become a true disciple of Jesus Christ, is a way of life and a daily commitment that will provide divine guidance. As you practice your religion, you are exercising your faith. 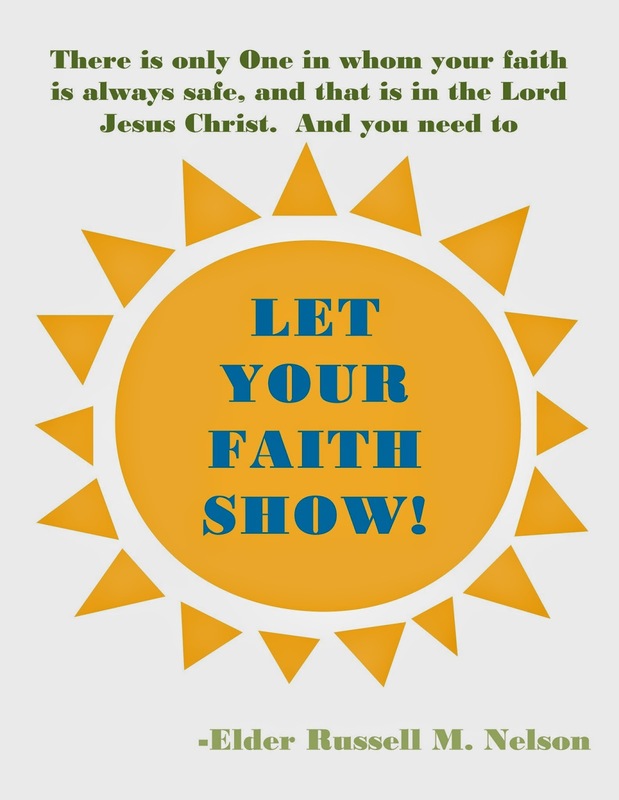 You are letting your faith show." Have you ever met someone that is one way when they are at church or around their church friends and then someone COMPLETELY different when they are around their other friends and not at church? Elder Russell says this is a dangerous game to play. "Danger lurks when we try to divide ourselves with expressions such as "my private life" or even "my best behavior." If one tries to segment his or her life into such separate compartments, one will never rise to the full stature of one's personal integrity--never to become all that his or her true self could be." Another quote that I love is, "Even if 'everyone is doing it.' wrong is never right. Evil, error, and darkness will never be truth, even if popular." Don't we teach our kids this basic principle? However, we start to forget this when we become teenagers and then as adults. He concludes by quoting President Thomas S. Monson, "Courage, not compromise, brings the smile of God's approval. ... Remember that all men have their fears, but those who face their fears with [faith] have courage as well." That is a quote that I have to read every day. When I am having thoughts of fear and doubt I need to have courage and increase my faith. I need to let my faith show!